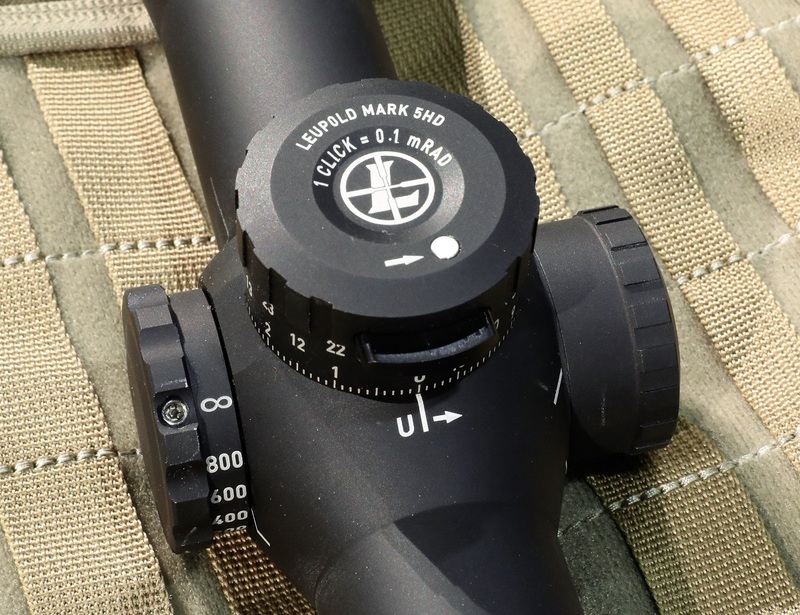 The new Leupold Mark 5HD 7-35×56 reaches out to long-range targets with ease. The popularity of long-range shooting competitions and distance shooting, in general, has rapidly increased in the past couple of years. It seems everyone wants to be a member of the 1K club and say they can connect with targets out to 1,000 yards and beyond. 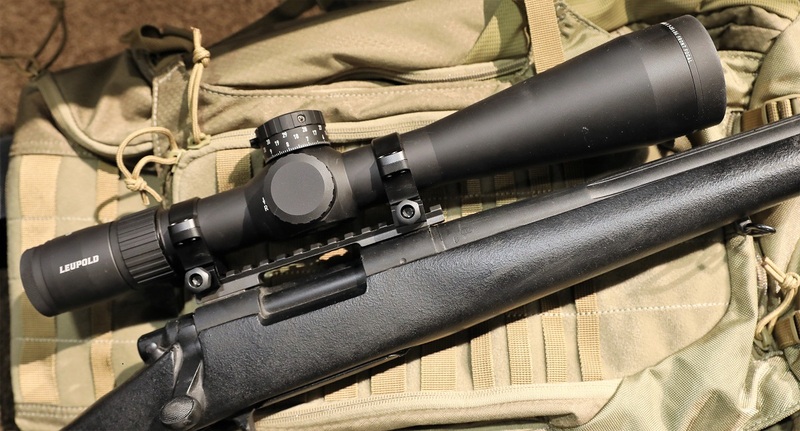 Scope manufacturers have taken notice, and Leupold is no exception. The company released the Mark 5HD 7-35×56 riflescope at the 2019 SHOT Show and we got a chance to throw some lead downrange using this new optic. The large 56mm objective of this first focal plane scope tapers down to a 35mm main tube. At first blush this scope will look very familiar to anyone who has seen or used the Leupold Mark 5HD in 5-25 magnification. 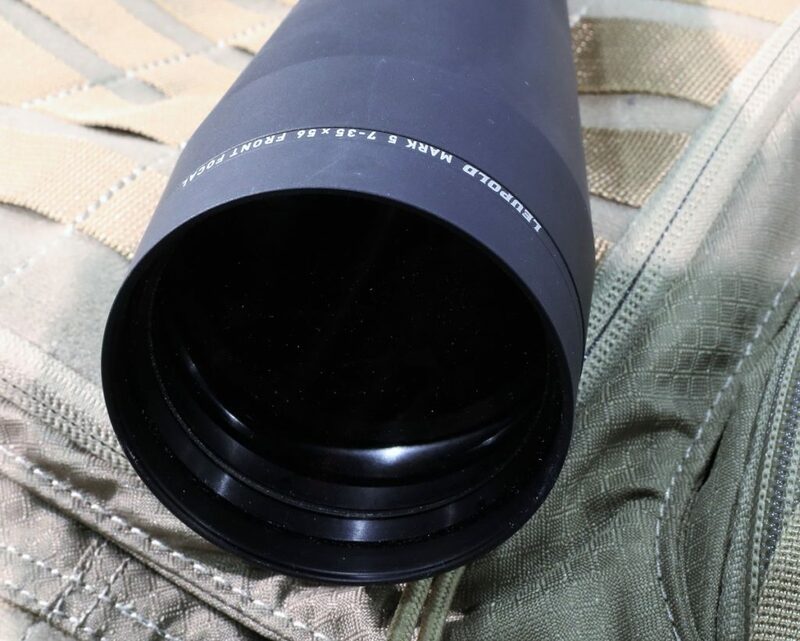 In fact, it shares the same main tube with its lower magnification brother, so tube size is not a source of additional weight with this new 7-35 version. It weighs in at a svelte 33 ounces, which is not much for scopes in this class. The turrets are also identical to the 5-25 model. The elevation turret has three rotations of adjustment for a full 100 MOA of travel, very positive click adjustments, and easy to read markings. The zero-stop feature is a rear facing button that prominently pops out toward the shooter. The zero stop button faces the shooter and the rotation knob pops out of the turret vertically. The windage adjustment is covered by a cap and shares the positive click feel with the elevation turret. Unlike most scopes, the zero indicator for windage is higher than the traditional 9 o’clock position. This is something other Mark 5HD scopes share, presumably because it is easier to see from the shooting position than the usual index mark location. This takes a little getting used to, but for competition it seems like a good idea. The left side turret adjusts for parallax as one would expect. The windage turret is covered with a cap (removed here). Note the higher than usual placement of the windage index mark. Initial impressions are excellent. The scope performed well on the long-range bay at Media Day. For lack of a better term, the scope is clear edge-to-edge and steel targets at several hundred yards were easy to spot and shoot. 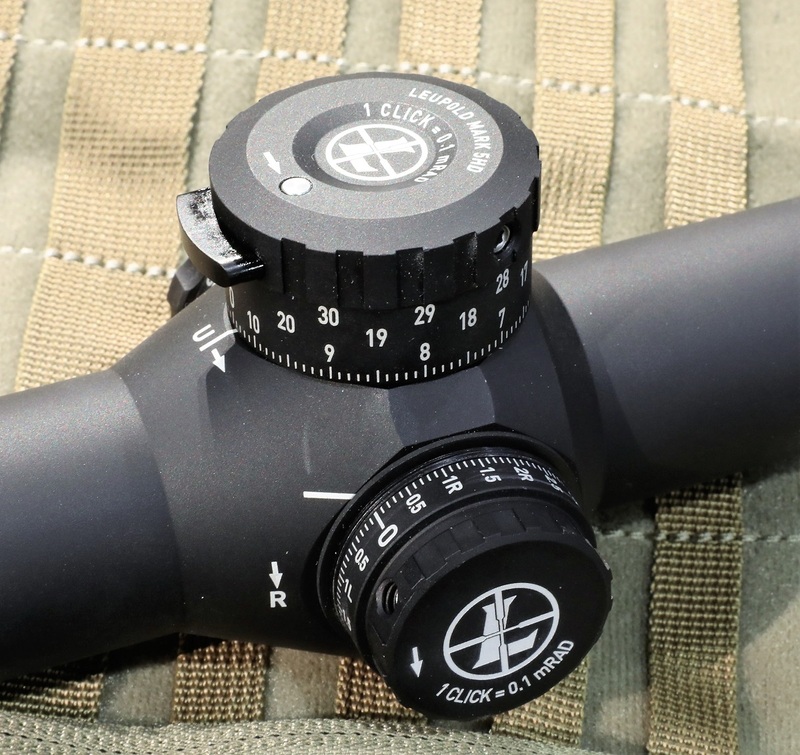 This front focal scope is available in MOA or MIL adjustments and reticles. Several popular reticles are offered, including the H59, the Tremor 3, and two Leupold proprietary styles – the Impact 60 MOA and the CCH. The Mark 5HD 7-35×56 will retail for $2,299-2,799 depending on reticle choice and illumination. These will be available in April of 2019, at which time we will do a complete review. The Mark 5HD comes with a short power selector ring lever (aka throw lever) to rapidly change magnification.